The water in the curb must have been a source of pride and youthful ownership or at least entitlement. It came mysteriously from a concrete box several blocks north. Its source was Jack and Jill Hillcrest grocery store where it was used to air condition the store. Hastings sits on the Ogallala aquifer. It’s pure cool water was a source of pride to the city, and the source of the only issue I ever perceived between my parents. My mother wanted it untainted, and my father decided the best public health policy would be to fluoridate it. Every election with fluoridation on the ballot resulted in them canceling each others votes out.With such riches in water, an inexhaustible and incorruptible supply it seemed, it was sensible to use it to chill houses and businesses and then toss it away. For Hillcrest, what couldn’t be absorbed in the city’s drainage system, went down our curb. Unfortunately my four year old sense of entitlement was rocked a few short days later. For whatever reason of street engineering, it started to run down his side as long as it ran at all. I had to cross from my side of the street to play in it. Why, I wondered, did the water have to run down Steve’s side of the street? It’s my first memory of the capriciousness of life, and of the feeling of envy. Steve and I would go on to do many other things, such as draping a tarp from my bedroom’s backyard window, and have a sleep over on the grass like pioneers. Since we were about eight, it lasted a couple hours and then we thought it more sensible to sleep in our beds. Steve’s parents had left the door unlocked for him. But to understand what it was like for us to grow up you have to know what our neighborhood was like. That first day I met Steve, the lot to the north of his house was empty, as were the lots behind his house, as were blocks and blocks to the north and west of his house. But the tsunami of suburbia was just beginning to wash over the area. Within ten years it would all be filled with homes and apartments. It was our boyhood gang’s dreamland. We could explore framed houses, moving through future bedrooms and kitchens, and if we were particularly brave go into truly unfinished basements. Even better was the continuous supply of mounds of dirt to ride bikes on, or play king of the mountain. Best of all we could have clod fights on them where we’d be throwing clods of dirt at each other until someone got hit in the face upon which the whole game would suddenly break up. While many neighborhoods in America were having this development we had something special: Anderson’s woods. Anderson was a doctor who owned 3/4ths of the block catercorner from my home. His house looked like a micro version of Disneyland’s castle. It was made of brick and large windows. On one corner was a rounded “turret” complete with a metal flag or weather vane on top. It was very unmidwestern in appearance. Directly to the east of the house, just across the street from Tim Deal’s house, was a tall stone wall made out of irregular football sized orange, brown, and beige rocks. By tall I mean seven or eight feet. On the house side of this wall was a stereotypical lion head spouting water into a small pool. The design set my standards for what a lovely garden should look like, and I have longed for a spouting lion head fountain ever since. The wall then continued north for much of the block but at a modest three or four foot height. While the castle occupied the southeast corner of the block, trees, mostly conifers, filled the northern half of the block, with a thinner line to the west of the house. Within 30 seconds Tim, Steve or I could be in what seemed the primeval forest complete with castle as we ran down the trail in the middle. It had so very many uses! We could play army, or cowboys and Indians in there. The Jacobi’s were allowed to have BB guns (my mom wouldn’t hear of me having one because it could shoot out a window, or far worse, someones eye (this comment now sounds like it was made for a Christmas movie special)). Like mighty hunters they talked of going to the forest to shoot at “bad birds” (sparrows, blackbirds, and especially blue jays) so long as the good ones (robins, and especially cardinals) were avoided. All the boys knew about the bad and good birds, but your 21st century scruples should know that to the best of my knowledge not a single bird (good or bad), window, or eye were ever shot. For me the best part of Anderson’s forest was climbing the trees. Their branches started at almost ground level making it an easy start, and with so many I could climb up to thirty to forty feet, all the while getting my hands sticky with pine sap. I could smell would be a reward and reminder of the adventure for hours. From my perch in a tree I would often watch the benign specter of Dr Anderson, his light-colored clothes and cap, as he gardened, occasionally walking under me, totally oblivious to my presence. The boys would generally avoid entering if we knew he was there, but that was rare. Occasionally we’d hear, “Hey! What are you kids doing?” and we’d be making up excuses or running. But mostly the forest was our own. And the stone wall. The wall was a test of strength and confidence. Jumping off the four-foot section was considered normal. But off the eight-foot section one had to think. We had help from the movies and TV shows with paratroopers in them, so we knew we had to land with both feet but then sort of roll them up, and for good form, fall over to absorb all that energy. Usually it stung a bit, but we had proved our mettle. One other fact of growing up when and where I did was that everyone my age in the neighborhood was a boy. At least until I was in Junior High School. As a consequence girls seemed like foreign entities for years and I had no real interactions with them until I was a senior in high school. Steve was the Jacobi’s first child, followed by Tim, Lori, Ron, Laurie, Mark, Debbie, and shortly before I left for college, Mary. The demographics of my family couldn’t have been more different. I had one sibling, a sister who was eleven years older. She was learning to drive when Steve and I were first getting acquainted. Steve was an extrovert, athletic, and would try a lot of things, while I was more introverted, a thinker, a reader. While he’d be organizing football games in the Deal’s lot, I’d be organizing the game room in my basement or playing teacher to our gang by having them memorize the planets from my wall poster. My reputation was such that the gang was amazed when, instead of picking a stogy old bike to replace my stolen one, I came home with a new stingray bike with it’s small tires, high handlebars, and banana seat. It was a very cool bike! Steve’s parents were Ed and Dolores. My strongest memory of Dolores was in the early years of our friendship. I knocked on the Steve’s front door to play but his mom told me he was sick. It was a cold bright blue winter morning with a few inches of snow on the ground. I went forlornly over to my side of the street but in a minute or two he opened the front door, all dressed up in his winter coat, and yelled he was coming out to play. Right behind him was Dolores. He ran north to the empty lot next door. Dolores ran north after him. He was running but his mom was running faster in an ever tightening circle in the middle of the lot, snow flying up from their feet. If you have the picture of a coyote chasing down a rabbit you have the right idea. He was taken down, then brought back up and went back into the house under protest with her holding the scruff of his neck. The other memories of Dolores are more muted. Usually smiling, often looking tired, always seeming to be doing laundry and supper. When I picture Ed, what stands out is a man who is not tall, but trim, tight and strong. He had a square face with thick black wavy hair about 1″ long with so much body it stood out from his head. He was usually smiling (unless the gang was having a tomato fight with the neighbor’s tomatoes), and always active. What also stands out is his voice, something impossible to describe well. I will only say it was like his body, “tight”. He seemed to limit using his jaw and instead let his lips do the work, making his words seem like they bound and contained the energy that wanted to burst out with each syllable. And like aunt Clara he had a certain enunciation that was somehow different without an obvious answer as to why. The last vestiges of his parents native language? Steve went to Catholic school and I went to public. But there were many things that kept us together. His basement for one. The Jacob’s basement was the nerve center of the gang. It served many functions. Here we organized work on a giant kite, and then attempted to sew plastic sheets together and mount them on the crossbeams of a kite, all the while wondering if it would pull one of us up into the sky. Unfortunately our technology of piecing together plastic sheets wasn’t up to the rigors of flying (if only we knew about duck tape) so it never got airborn. Still it was this project that got me interested in the big kites we’ve flown, where a 100 pound test line is recommended. Off in one corner of the basement was Ed’s train set. This was no ordinary loop, with one train. It had mountain tunnels, a small village, railroad crossings that worked, train yards for the multiple trains, engines that puffed smoke, and was made complete with a portion that looked like Ed’s old family farm yard (something I’d learn 40 years later as he gave me a tour of the basement). I could not help but be interested in trains in Hastings so this miniature of a whole country was mesmerizing. I still linger on the thought of having one of my own. The basement was a social center where we could share thoughts on tonsillectomies, or how they got the colors in Fisher Fountain. It was the entertainment center where we could watch TV such as NBC’s Saturday Night at the Movies from Hastings’ local channel, KHAS Channel 5. On March 3rd, 1962 I watched the most terrifying movie of my life, The Day the Earth Stood Still, in their basement. A flying saucer lands in Washington, D.C. and Gort, the big stiff robot walked out, opened a visor, and vaporized pistols, tanks, and people. It turned out Gort was the ultimate weapon, an autonomous robot that could destroy the world if we were unruly. Fortunately later in the movie, when we did get unruly, Klaatu the alien who flew in with Gort, teaches the pretty woman a safe-phrase, “Klaatu barada nikto.” He told her it would stop the destruction to come. She had to reach Gort and utter those few words. She obviously does, and in the end the people of Earth are warned that should they misbehave again, more Gorts would arrive and we’d be goners. For months (it seemed like years) my curtains were drawn before the dark. Seven weeks after watching this I went to bed on Easter. With the lights out and the shadows of darkness moving in I was suddenly terrorized thinking I was seeing an alien, thinking I should hide under the covers. In a moment I realized it was the Easter Lily in my room. Curtains and covers: nearly the only protection a nine-year-old can get from world destroying robots. But in my case I had an ace up my sleeve. I too had memorized the immortal words, “Klaatu barada nikto,” in the two or three times he uttered them to the pretty woman. I was as desperate as she was to learn them. Over the years I’d occasionally repeat it to make sure I was ready at a moments notice should Gort lumber out of a dark alley. Psychologists tell us that humans are far more confident in their memories than they ought to be. Since reading these studies I’ve come to realize how fallible my own memory is. Almost daily I see a movie or a TV show and remembering I’ve seen it (though sometimes I don’t even do that), I’m at a loss to describe the plot even a few months later. But psychologists tell us we’re much more likely to remember strong emotional events.This movie was a strong emotional event. Fifteen years after seeing it in Steve’s basement I watched it a second time in a small theater in Lincoln Nebraska. The burning question for me was could I have saved myself, and in the process saved the world too; did I have the phrase right? Much to my satisfaction I did. But another 15 years after feeling the joy of this small memory victory, you my dear sons watched my copy of the movie, though I’d warned you of the possible psychological harm such as I had to endure. What were you? About nine and twelve years old? And your reaction? “I thought you said it was a scary movie dad! It was dumb,” you said with a tone that clearly told me you thought it was a terrible waste of time. Perhaps the world need not concern itself with Gorts, but instead how the terrifying has become the blase. It wasn’t only movie dangers I learned in his basement. Real ones lurked there too. It was here I learned about electricity and the right and wrong way to handle it. You see they had a stereoslide projector. Back in the day you could buy circular disks that had two pictures of the same thing but from offset perspectives like your eyes. Viewing this through a handheld viewer it would appear 3D. They also had a small projector to show just one of the images. That night it wasn’t working and with several people in the basement with me, each doing their own things, I decided to fix it. I wondered if the bulb was burned out, or if electricity wasn’t getting to the bulb. In a moment of inspired seven-year-old logic, I stuck my finger in the bulb socket and instantly got muscle aching vibrations going through me. Clearly the electricity was working better than my brain. This, world, is the first time I’ve admitted doing this. It was just too embarrassing to let anyone know I’d ignored a lifetime (of seven years) of advice to be careful with electricity. This same lesson, in a different form, would happen a few months later in the same basement. I’m sorry I didn’t tell you Steve about my experience before because he ended up having to learn it on your own. Yes, once again terror in the basement as I watched Steve when he found a light cord. You could plug it in but instead of a light at the end there were just frayed wires. Steve, ever curious, wondered what would happen if it was plugged in. I was backing away and quietly yelling (not a contradiction if you realize I didn’t want his mom to hear) that it was dangerous. He waved it around a bit and then fortunately touched a toolbox. There was a spark a moment before all the lights went out. Again Delores was rushing down the stairs to see what had happened and I was leaving listening to Steve’s explanations and thoughts about fuses. I must digress a moment. As I mentioned early, the model train set motivated an interest in trains. Growing up in Hastings, I couldn’t help but be interested in trains. The town was proud of its rail heritage, being founded in 1872 at the intersection of the Burlington & Missouri River Railroad and the St. Joseph & Denver City Railroad. Named after a contractor of the later, Colonel Thomas D Hastings. In my time it was the trains of the Union Pacific; and the Chicago, Burlington, and Quincy (though everyone just called it the Burlington) that rumbled through town by the OK Cafe, where we ate our Sunday-morning-after-church breakfasts, or by my grandparents on the east side, blocking that part of the city off from the rest, including the fire trucks. But what really cemented my love with the rails was riding the California Zephyr. My parents loved to travel, to see and do new things. It’s a bug that I inherited from them and worked hard to pass on to you two. In 1964 they decided it was time to do it a new way. We boarded a DC-3 at Hastings airport and we flew to Sacramento CA. Being bumped to first class in Denver allowed us to fly over the Grand Canyon while eating exotic macadamia nuts for the first time. We watched my sister graduate from Sacramento State College, and did the usual visiting of relatives and tourist spots. For the return trip we boarded a 727, newly introduced to United’s jet fleet a few days earlier, and flew into Denver only to take a taxi to from the airport to Union Train Station to board the California Zephyr. We had our assigned seats but I spent the entire trip in the Vista Dome watching the landscape roll by. I fell in love with the singing-zinging of the wheels, and the clickety-clack as they crossed the rail joints. I loved how trains seem to start imperceptibly, so different than planes that pushed you back your seat. It has influenced my driving because, rather than squealing tires, I wanted to make those oddly almost imperceptible accelerations and stops, a good thing to know when the gas crisis emphasized that same kind of acceleration. While in college I’d often spend my $10 to board the Continental Bus in Lincoln and come home Friday night for a weekend in the city, stopping at every little town and turning a 90 minute car trip into a two and a half hour bus journey. But going back to Lincoln I’d sometimes take the more expensive and inconveniently early train ride, always going up to the Vista Dome to watch Nebraska roll by and the sun rise over the horizon about the time we got to Lincoln. This is all to say I fell in love with trains and their Vista Domes. 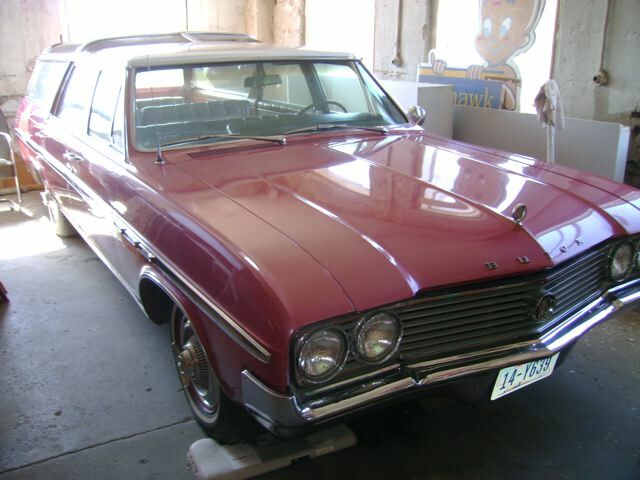 So you can begin to understand about another envy of the Jacobi’s when they brought home their new red 1964ish Buick Skylark Vista Cruiser station wagon. Never before or since has there been a station wagon with a strip of sky lights around the slightly raised back roof, a sort of moon roof for station wagons, though it was called a “skyroof”. You couldn’t see much out of them but they were so so so very cool. Despite lobbying my parents to consider the advantages of such a vehicle I was left with only wishes that we had one too. The Jacobi’s had one other thing that I admired, longed for, and envied. They were builders. From the model train set, to sheds, to play houses, to tree houses, to extra storage in the garage. This was so different than my family. Before he retired the only handyman thing my father did was switching the air conditioner over to the furnace and back again. Twice a year we’d wait until we were certain the season had changed. In the fall we’d spend a few days moving the electric heater around, baking more, and wearing lots of cloths to stay warm in the house. In the early summer there would be a few days of uncomfortable heat. Then dad would bring home a tray of tools from his auto shop: crescent wrenches, screw drivers, a can of oil. For an hour he’d adjust fan belt pulleys to change the air speed, put in or take out pieces of wood and sheet metal to switch the airflow through the heat exchanger or the water coils, change the air filters, and light or extinguish the pilot light. And if the A/C was going to start its summer run we’d move all the things under the water cooling coils so they wouldn’t get wet from the constant drip of condensation onto the basement floor, where it headed for the drain and endangered anyone who walked near it from slipping. In the summer it felt good to feel the first traces of cool air coming out the vents. But for me, the first heating cycle of the fall was almost magical. First heat had a smell. It was of the dust in the heat exchanger burning out with the first flames, but for me it was the smell of victory against the elements. It signaled Halloween was near, followed soon by snow and the holidays, and all the while we would be warm and comfortable when we wanted to be. It reminded me that all could be well in the world. Then, as now, I love that smell, and love that moment in the year. But still it felt a bit embarrassing as a child that, unlike the Jacobi’s, this was all my dad seemed to know how to do in the realm of building, home remodeling, and repair. We didn’t even have a jig saw. We barely had a hammer! When I painted my room as I hit my teen years, it seemed like a small victory in remodeling and design. Three walls were light blue, the fourth dark, an esoteric color scheme just like the new courthouse that I’d toured. So what building I did was with Steve and his brother Tim, and Tim Deal. That building consisted of pulling up 2×4’s and plywood into a neighboring tree, on the corner of 13th and Bellevue, to build a tree fort. We hammered nails into the “studs” and tree in somewhat random patterns. I learned hammering was not as easy as it looked, and had some risks I hadn’t fully appreciated before. When it was completed we’d crawl up through a hole in the floor, put a piece of wood there to cover it up, survey our fiefdom, followed by plans for playing army, cowboys and Indian, or just talking about what the neighbors were doing. In the winter our attention would turn to the jig saw. All saws seemed at least slightly risky to me, so the jig saw was in the same category as a BB gun. Something to wish for, so one could live a full and adventurous life, but not to be expected in my family. I watched intensely as Steve and Tim would make patterns cutting out wood and assembling odd little things. There seemed no end to the possibilities they came up with. Other projects ensued in the family. Ed built a shed in the back to house the lawn mower and other garden items. A sandbox was built and next to it a playhouse far bigger and more elegant than our ramshackle tree house. It even had a door with a latch. Ed also built a storage space in the garage. It was not much; wood framing over the spot for the car, with a plywood floor on the frame, and an opening to crawl up from below. It was very much like a tree house, only under a roof. Not easy to climb into, and cramped when the gang held meetings there. It was in one such meeting that I learned the truth about how babies happened. Steve said his father told him. The gang gathered around leaning into a tight circle and listened intently with the same fascination and vague horror that most people have passing by serious car accident. I knew what he was saying had to be the truth because no one could make this stuff up! Steve and I both started piano lessons about the same time, but we took very different paths. I quickly grew to hate the daily hour long practices. But all that is another story. Steve thrived on them and got better and better. Music became a big part of his life. 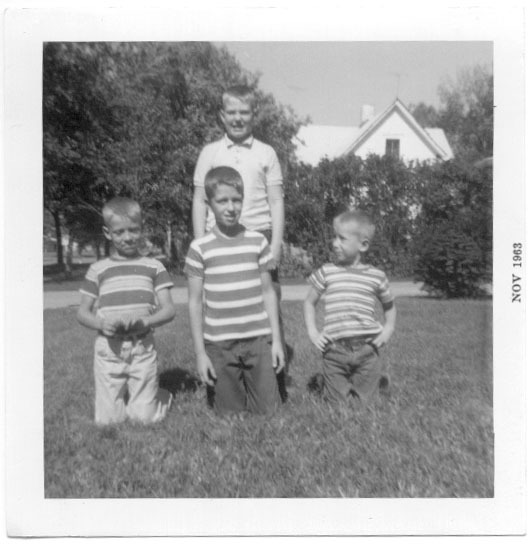 In early June 1967 I went over to Steve’s house late in the afternoon. He said he had something important to show me. Sitting in the living room he brought out the latest Beatles album he’d just purchased, Sgt Pepper’s Lonely Hearts Club Band. “Everyone is talking about this album. It’s going to the the best Beatles album ever!” With some small reverence he put it on the record player and turned it on; the needle carefully eased it’s way onto the record, and the music began. It’s the only album I clearly remember the first time I heard it. From the odd, old timey start with a full band, nothing like the rock & roll of the early Beatles, or any popular group that’d I’d heard (of course I excluded all the music my parents might have liked). From beginning to end it was different than anything I’d heard before. And the ending! “A Day In The Life”, with what seemed like a never ending (it was 40-second) E-major chord. Was it done? The needle stayed locked on the record. Steve and I looked at each other. Was something wrong? Then a squabble of voices and the needle lifted. We looked at each other smiling and laughing. This was something entirely new. I wasn’t even sure I liked it that well, it required an entirely new frame of reference. What were some of those odd sounding instruments? Steve thought they were called sitars. About this time Ed came home and wondered what this was all about. “What do you have there?” he asked. “The Beatles brand new album,” Steve said. And so it went. Of course now we know, in that small living room in south central Nebraska, a new era was entering. Hippies, psychedelics, Peter Max, predator Manson, Vietnam mayhem, powerful protests, and giving peace a chance. But at that moment, it was supper time and I went home. You might conclude from this that Steve’s parents wanted his musical interest and ambitions to avoid the latest chart toppers, but you would be wrong, at least in time you would be wrong. It was not too long after this that the Jacobi garage became the rehearsal room for a band. The neighborhood would be thumping with the drums and bass, vibrating with the Leslie speakers spinning around, and Steve would be on keyboard. Police would stop by, once or twice, and the garage door would go down to try to contain the sound, but the neighborhood mostly tolerated these early evening practices. After all, Ed was out on the sidewalk seeming to enjoy it, or at least seeming to be interested and approving it. As I write these words I find it’s like hiking away from a tree line in the wilderness. With my topo map I think I know the lay of the land, but when the view is no longer obscured in the forest of details I find surprises. I now have a moment of recognition: Ed Jacobi provided the animate spirit to my neighborhood. I hope, my dear sons, that you remember your first neighborhood on Cherrywood Drive. For two blocks neighbors helped neighbors, we had block parties with my homemade ice cream and neighbors bringing plates and cookies; our massive fireworks on the Fourth of July required several trash cans for all the remnants the thirty of us swept up together; we watched over each others children; and Halloween was a big neighborhood deal. We left that neighborhood for the American Dream: a bigger house in a prettier suburbia. And it turned out, that suburbia was sterile. Oh neighbors waved at each other and were polite but that was the limit. Instead of a few blocks to a store it was now over a mile to anything but the elementary school. And instead of many children there were just a couple. I realize now that putting you there was like planting sun loving plants under a shade tree. It was hard for you to thrive. I also realized how precious the first kind of neighborhood can be. It is a kind of oasis in the timeline of our lives. It’s a place where the word “community” becomes almost a solid, like the garden soil, nurturing a person. To make that kind of community you need some sprite (“sprite” derives from Latin for “spirit”) that keeps it together. Our Colfax neighborhood had Harry. Harry was the first neighbor we met. He walked up and down the street, occasionally blew the snow off the walks in a two block circuit, or just let you know how Delbert was doing down the street. He sat out in his lawn chair on his driveway and waved as you went by. You told him when you were away for a few days just to make sure the house was safe. He was on our roof helping me install an attic turbine in the first couple months we were there. In the neighborhood I grew up in, Ed Jacobi was that sprite. In the summertime Ed would pile the gang into the station wagon or Nash and take us to Hastings Lake early in the morning to fish, and catch crawdads. Or we’d go a few miles west of Hastings to Juniata on the 4th of July to buy our fireworks. It felt almost conspiratorial since we weren’t supposed to get them or even light them up in town (though in some other black market one year Ed got the really big M80’s and Cherry Bombs which the Jacobi’s used so expeditiously to blast cans into the air). Or he’d drive us out to the county fair which would fill our noses with the smells of manure, cotton candy, and popcorn. In the winter he’d take us to the big hills to ride our sleds, two (and maybe three) boys piled on top of each other, riding fast, snow flying all around. Occasionally he’d take his turn rushing down the hills. We’d stay until I had a desperate need to pee, and my toes were so cold I thought I would never walk on them again, all the while never saying a word about my predicament. And then there was his presence and pride as the Fabulous Suns got better and better. His presence added immeasurably to our lives. As Tim Deal wrote me a few months ago, “Ed Jacobi…played a critical role in allowing me to understand the healthy role a father provides to a family setting”. Envy is a funny thing isn’t it? Every year my family would take a vacation. On an every other year schedule we’d go fish in Canada and maybe take another vacation besides, to Colorado, or California; Yellowstone or the Grand Canyon. Every summer weekend that we weren’t on vacation we’d be spending time at Harlan County Reservoir for fishing, boating, and barbecuing. And the Jacobi’s rarely left, except perhaps to drive to their grandparents in central Nebraska. I knew of my benefits and advantages. But I’m human, and like most humans, for the most part, I look more at what I don’t have, than the great gifts I do have. I looked up the ten commandments as I wrote this. Commandment V tells me I shouldn’t murder. Not killing people is easy enough. Commandment II, not taking the Lord’s name in vain, was OK when you’re under 14, and a little tougher when you hit your finger with a hammer. But that commandment X? “Thou shalt not covet they neighbor’s house or his field, or his wife, or his servants, or Lexus, or MacBook Pro, or anything else.” It Forbids our internal envy dialog, our coveting. I coveted the Jacobi’s milk box door. As such, it was like a land mine to my salvation. Unlike our old fashioned metal insulated box at the back porch, they had a door about 5″x12″ next to their kitchen window. The milkman, on his twice a week stop, would just walk up to the front of the house, open the little door, and exchange milk bottles. Steve’s mom could then just reach over from her kitchen sink to get this sustaining liquid. It was so modern, and taunted me from the street. Why couldn’t our home have something to make the milkman proud to deliver to us like the Jacobi’s. And near that window was their shortwave radio, an intriguing piece of technology with its wood cabinet, about as big as a modern day microwave. Turning the dials brought signals through the glowing vacuum tubes so I could hear the languages of the world. Why didn’t my family have one? For me those small seeds of boyhood envy caused me to work on getting over that envy. We worry about what we think we’re missing, and work hard to make it better. So I worked hard at learning how to be a builder too. I can now say I have a jig saw, table saw, and miter saw, along with other boxes of tools. I’ve reshingled two of my homes, remodeled kitchen and bathrooms, built a shed, gotten to really enjoy electrical work in homes, and I can tolerate plumbing. In short, Ed’s spirit has moved me too. The last time I met Ed there was another internal dialog in me. It wanted to tell him that I could do a lot of these things myself now. I wanted to impress him, and maybe make him proud. Dad passed away yesterday morning. He had developed heart issues over the last few months and things got the best of him. We were able to take him home about a week ago where Hospice placed a bed in the living room. He was able to see all the grandkids along with relatives and friends last weekend. Throughout the week though his conditioned changed where he wasn’t responding as well. He passed peacefully. It got me thinking about my own mother, and how we too brought her home to our living room to let her die in the place that she loved, the place where those who loved her could be by her side. The Buick Vista Cruiser in it’s store home. 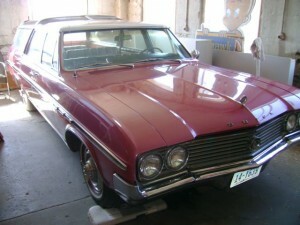 It also got me thinking about the Vista Cruiser again. Steve had told me his dad still had it, keeping it on the second floor of his carpet store. Ed would go up every couple weeks and run the motor a bit to keep the engine in good condition, but it hadn’t been on the streets for a while except as a prom-mobile for the grandchildren. I find I no longer crave a fancy milk box, but I still think it’d be nice to take one more ride in that amazing Vista Cruiser. Some things we just can’t get over. On another note, this really hit home big time tonight. Mom (Dolores) passed away just a couple of days ago. We took her to Mary Lanning a week ago Monday with her complaining of back pain and really hurting. By Wednesday they had her in ICU and out to a regular room on Sunday. But, things still weren’t going that well for her. I was visiting her Monday evening (Feb 10) up there and she was her spirited self but couldn’t breathe very well. She said they were taking her for a Heart Cath in the morning to find out more of what is making her not feel well. On Tuesday we received the call for the family to come asap to the hospital…”they are having complications”. Mom’s blood pressure went to zero during the procedure and they tried for a good 40 min to revive. She passed in the surgery room. We were there in the waiting room when we got the news. Your recounting of days past on Bellevue mean the world to me and my brothers and sisters. I’ll want them to read this draft over the next few days. I can’t tell you how much this will touch our family and at such a perfect time. You take special care yourself. We’ll stay in touch! See other Dadden Stories here.